Where can I find the particular bubble blower that I want? Where else can I find bubble blowers? How much do bubble blowers cost? Why do bubble solution recipes often call for glycerin and where can I get it? How many bubble blowers do you have? For current new bubble blowers, you'll probably get your best prices at a local toy store. However, specific bubble blowers usually are gone from the stores within about a year. So if you want a bubble blower that is no longer in stores, you will need another source. Most of the bubble blowers that are in my collection came from eBay. You need to watch for the item you want for a while to get the best deal. At eBay and other online auction sites, be sure to check the shipping charges before bidding. If they are not listed in the auction, send an email to the seller requesting the amount for shipping and handling. Also, be sure you click on the number in parentheses after sellers' names to see if they have been reliable sellers. This search string finds most bubble blowing items, but it picks up a lot of unrelated items as well. New bubble blowers are available in almost any store that sells toys, with more variety available in spring and summer. Garage sales and flea markets often have bubble blowers, although they may be difficult to spot. Watch for sales of children's toys, and ask the sellers if they have any bubble items. Antique shows--especially ones focusing on children's toys--can be good sources. However, study up on online auction prices first to make sure you aren't overpaying for the items. Bubble blowers vary greatly in price. You may find some free ones with advertising on them or in a child's fast food meal. Plain pipes and wands are often the least expensive. New pipes and wands found at a toy store may run from $1 to $5. Used ones may sell for under a dollar at garage sales. New battery-operated bubble blowers may run between $10 and $30, with the more expensive ones tending to be licensed characters (such as Winnie the Pooh, Sylvester, and Snoopy). Older ones--for example tin and plush blowers from the 1950s and 1960s--are likely to start over $30, with the price increasing dramatically with uniqueness, working condition, rust, age, and other qualities. Vintage bubble sets from the 1940s and 1950s have dropped in price as more have become available through online auctions. Sets usually included a wooden pipe, tin plate, and soap, all in a box with colorful graphics. You can find the more common ones in fairly good condition starting at about $15 and going up from there. Some of the most sought after bubble blowers are old tin ones in excellent working condition. The 1950s Linemar "Bubble Blowing Popeye" sells for $700 to $2,000, depending on condition. Gino the Neopolitan Bubble Blower, the Bubble Blowing Musician, and Bubble Blowing Boy are other battery-operated tin blowers that may sell over $100 even in non-working condition. Glycerin is a liquid emollient (something that softens or soothes) used in soaps, skin softeners, and candle-making, among other things. Glycerin (and other additives, such as light corn syrup) help thicken the skin of the bubble, allowing it to evaporate slower and last longer. You should be able to find glycerin wherever you get your prescriptions, in the pharmacy area of the local discount store, or in craft stores. I found a four-ounce bottle at my drugstore for $3, and saw a gallon for sale online for $20. There may well be less expensive glycerin available elsewhere. The Bubblesmith, Sterling Johnson (Bubblesmith.com), recommends TheChemistryStore.com for buying glycerine online. 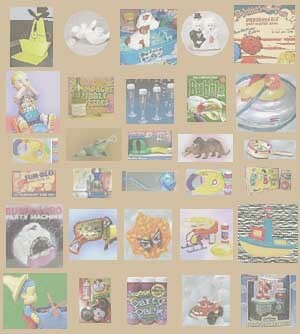 At last count, in March 2006, I have over 800 bubble items, most of which are bubble blowers. This means that I have a LOT of them that have not yet been listed on the site. If you are interested, you can see the items that I own and do have listed here. Email me with any questions you think should be answered on this page.